Property LocationLocated in Dubai (Trade Center), Dusit Thani Dubai is within a 10-minute drive of Dubai World Trade Centre and Dubai Mall. 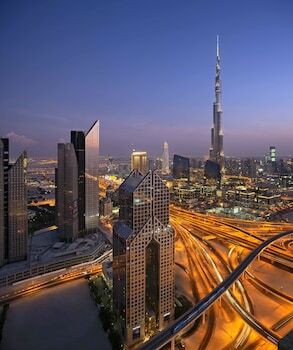 This 5-star hotel is 3.1 mi (5 km) from Burj Khalifa and 4.6 mi (7.4 km) from Dubai Fountain.RoomsMake yourself at home in one of the 321 air-conditioned rooms featuring refrigerators and LCD televisions. Complimentary wireless Internet access keeps you connected, and satellite programming is available for your entertainment. Private bathrooms with separate bathtubs and showers feature complimentary toiletries and hair dryers. Conveniences include safes and desks, and housekeeping is provided daily.AmenitiesPamper yourself with a visit to the spa, which offers massages and facials. You can take advantage of recreational amenities such as a nightclub, a health club, and an outdoor pool. Additional amenities at this hotel include complimentary wireless Internet access, concierge services, and gift shops/newsstands. If you'd like to spend the day shopping, you can hop on the complimentary shuttle.DiningEnjoy international cuisine at 24th Street , one of the hotel's 3 restaurants, or stay in and take advantage of the 24-hour room service. Relax with a refreshing drink from the poolside bar or one of the 2 bars/lounges. Buffet breakfasts are available for a fee.Business, Other AmenitiesFeatured amenities include a business center, limo/town car service, and complimentary newspapers in the lobby. Planning an event in Dubai? This hotel has facilities measuring 17007 square feet (1580 square meters), including a conference center. A roundtrip airport shuttle is provided for a surcharge (available 24 hours), and free self parking is available onsite.